Kowabunga dude! Big Break takes you to where big waves rule and in the game you can win a top jackpot of a cool 10 grand. There are 5 reels and 15 paylines in the game. You do not have to be a high roller to play Big Break since the betting range if from 1 cent to $70. Feel free to test the game with no download required right here. There are many features in the game such as a wild and scatter symbol, a multiplier, a bonus game, and, yes, you can win free spins. 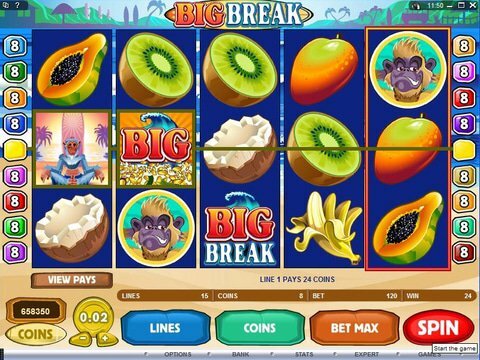 The beach themed symbols in Big Break include several fruits, a monkey with a surfboard, Munky Wax, a Lucky Break logo, and the Big Break logo. The Lucky Break logo is the wild and it only shows up on the 5th reel and the Big Break logo only substitutes for certain symbols and also triggers the bonus game. You will win 15 free spins if you spin on 3, 4, or 5 of the Munky Wax symbols. In the bonus game there are ape dudes and dudettes and they show up on the reels and you hit the stop button and depending on which one shows up will determine your payout. You can win up to 50 times your triggering wager, so it can be a HUGE payout. This free game is not only easy to play with a slick interface, but also has wonderful sounds and graphics from Microgaming. You should be aware that to win the top real jackpot you have to click on the Bet Max button. Head to All Slots Casino to play this killer game. All Canadian players are welcome to enjoy this top rated casino. They have competitive incentive offers that draw in new players daily, and keep loyal ones for years.